Mike Evans and DeSean Jackson are excellent downfield threats for the Buccaneers. After a sloppy-but-impressive win over the Atlanta Falcons, the Philadelphia Eagles will take on another NFC South challenger in the Tampa Bay Buccaneers, who put up 48 points on the Saints Week 1. Here are five matchups to watch. In Week 1 against the Falcons, a familiar issue reared its ugly head. That would one of the Eagles corners getting toasted on a double move. The victim Week 1 was Jalen Mills, who bit on an out route by Julio Jones, leaving Jones wide open down the field for what should have been a touchdown. Instead, the throw led Jones to the outside, Jones didn't catch it cleanly initially, and then the officials blew the call when Jones was able to regain control of it in bounds for what should have been about a 55-yard gain. The Eagles avoided a disaster there, but the double moves remain a problem. 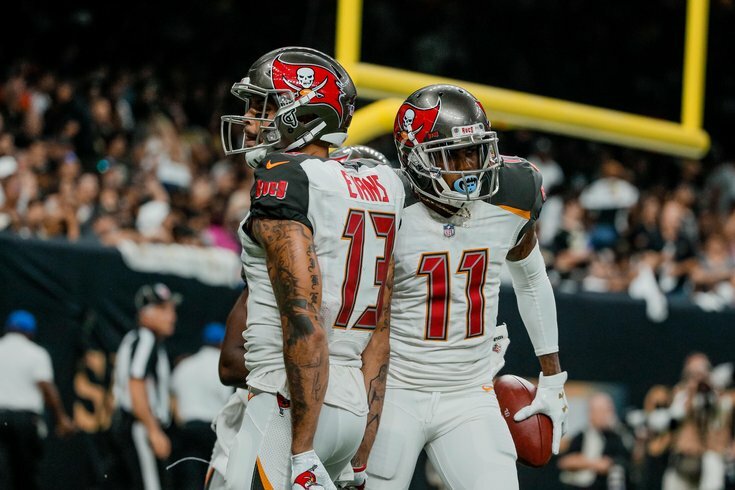 The strength of the Buccaneers roster is their pair of downfield threats in DeSean Jackson and Mike Evans. Jackson, as you already know, wins down the field with speed, while Evans is a 6-foot-5, 231-pound match up nightmare who excels at making contested catches. Against the Saints Week 1, Jackson and Evans combined for 293 yards. "DeSean Jackson has always been a guy that can take the top off the defense," said Jim Schwartz. "We played him in a game two years ago and he made a lot of big plays like that. Took us a while to get adjusted to it. And then you get a guy like Evans, even if he's covered, he can still be open. He's a very physical player. You have to be physical with him. So there certainly is two different styles of player." Jackson has killed the Eagles with big plays ever since Chip Kelly decided that his best receiver (by far) wasn't worthy of a roster spot anymore. In 5 games against his former team, Jackson has 20 catches for 440 yards (22.0 YPC) and 2 TDs. In 2016, Jackson burned Schwartz's defense (as noted above) with an 81-yard TD bomb. Jackson may not get a chance to burn the Birds once again on Sunday, as he suffered a concussion and a shoulder injury Week 1 against the Saints. Jackson's absence would be a big break for the Eagles. In addition to Evans and Jackson, the Buccaneers have a pair of tall tight ends that they like in Cameron Brate (6-foot-5, 236 pounds) and O.J. Howard (6-foot-6, 242 pounds). Over the last two seasons, Brate averaged 53 catches for 626 yards and 7 TDs. Howard, meanwhile, was the Bucs' first round pick (19th overall) in the 2017 NFL Draft. "We talk about Evans being a big guy with a big catch radius," said Schwartz. "Howard is the same guy. All their tight ends are huge, 6-foot-6 guys. Gives the quarterback a big strike zone to be able to throw it to. You've got to be careful in man-to-man coverage of keeping good vision on the quarterback as well as seeing your player, because the quarterback has such a big area that he can throw a guy open. I mean, that's a lot with their tight ends." Howard finished the 2017 season strongly, as he had 12 catches for 205 yards and 3 TDs in his final five games. In 2018, he's off to a good start, after catching 2 passes for 54 yards against the Saints. A highlight reel for the 2017 season. Schwartz prioritizes coverage ability in his linebackers, and he likes his safeties to have some cornerback experience in their backgrounds. Matchups like these against teams with good tight ends are part of the reason why. The Eagles will get a boost with the return of Nigel Bradham from suspension. With a team that likes to throw downfield, the trade-off offensively is that those routes take longer to develop, meaning that the quarterback has to hold onto the ball longer. That, of course, gives the defense more time to get to the quarterback. #Analysis. In 2017, Jameis Winston held onto the ball, on average, for 2.77 seconds, which put him in the top 10 of quarterbacks in that category. Fitzpatrick's average time to throw was 2.66 last season, in a smaller sample size. Of the four quarterbacks the Eagles faced last season who took longer to throw than Winston -- Russell Wilson (3.05), Jared Goff (2.93), Dak Prescott (2.82), and Case Keenum (2.78) -- the Eagles were able to get strip sacks on three of them. In five career starts against the Eagles, Fitzpatrick has been sacked 14 times, and those were with offenses that did not take as many shots down the field as the Bucs. The Eagles' front four (Fletcher Cox especially) dominated the Falcons' offensive line Week 1. They will have opportunities to get after Fitzpatrick on Sunday, and they have to make them count. The Buccaneers have a very good defensive tackle in Gerald McCoy, who has 39.5 sacks over the last 5 years, and 3.5 sacks in 3 career games against the Eagles. Beyond McCoy, the Bucs spent a lot of resources on their defensive line, and have a number of familiar faces there. "They really invested heavily in the defensive line," said Mike Groh on Tuesday. "It's obviously all built around Gerald McCoy. He's a guy that can wreck the game, so somebody that we got to pay special attention to. And guys like JPP and Vinny [Curry] and Beau [Allen] who we know really well. They've really bolstered that unit, and it paid dividends for them last week." • Gerald McCoy: Former 3rd overall pick, signed a 7 year, $95.2 million contract extension during the 2014 season. • Jason Pierre-Paul: The Bucs traded a third round pick (and a swap of fourth round picks) for JPP this offseason, and assumed the remaining three years of his contract, in which he'll count for $12.5 million against the cap in 2018, $14.5 million in 2019, and $12.5 million in 2020. • Vinny Curry: Signed a three year, $23 million contract this offseason. • Beau Allen: Signed a 3 year, $15 million contract this offseason. The Bucs also drafted DT Vita Vea in the first round (12th overall) in the 2018 NFL Draft, but he missed Week 1 with a calf injury. The Eagles have arguably the best offensive line in the NFL, so this would be a strength-on-strength matchup, that is if you consider the Bucs' defensive line a strength. Foles will get the start on Sunday, per Doug Pederson, and as always, it will be a mystery which Foles shows up. There never seems to be any middle ground with Foles, as it's usually "good Nick" or "bad Nick," and rarely something in between. Week 1, Eagles fans endured "bad Nick," but the Eagles' defense was able to steal a win. Against a Bucs defense that allowed 439 passing yards and 3 TDs a week ago, Foles will have an easier test than he did against a much better Falcons pass defense.